It has been a day of blue sky and scattered light clouds. The air has been clear and afforded good views of neighbouring islands. In Scarinish we cannot see the Small Isle of Eigg but we look out on so many others. 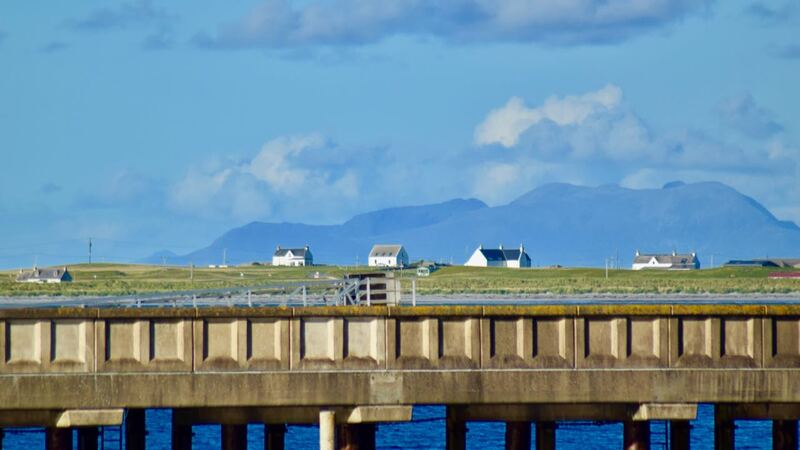 From our south facing lounge window we could see the Paps of Jura. It is amazing to think that the ‘Paps’ are 50 miles away. We could even make out West Islay. We cannot see the Isle of Mull from any of our windows. However we don’t have to walk far to see the Isle. Ben More is Mull’s Munro. Bac Mòr is one of the Treshnish Isles. It is often called the Dutchman’s Cap because of its distinctive shape. 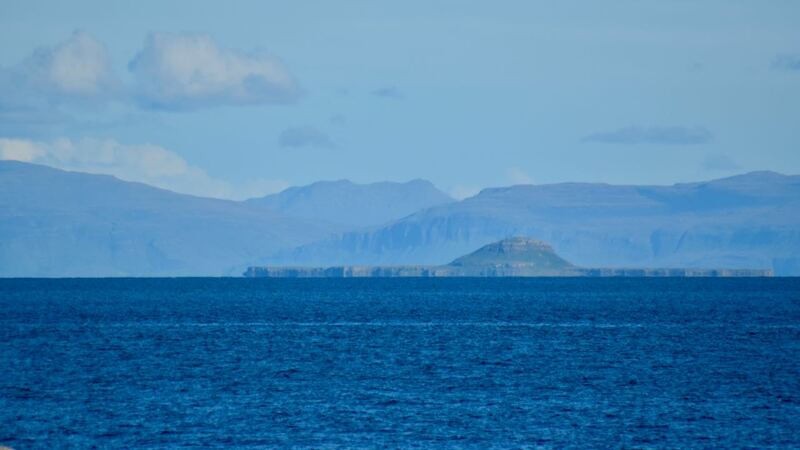 On a day such as today we could make out many of the Treshnish Isles. 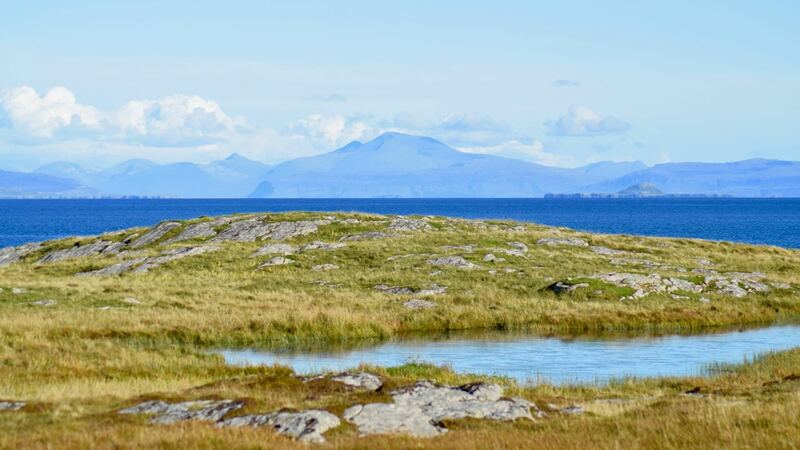 This well known archipelago lies between the Isle of Tiree and the Isle of Mull. The Small Isle of Rum is one of the islands that keeps moving. 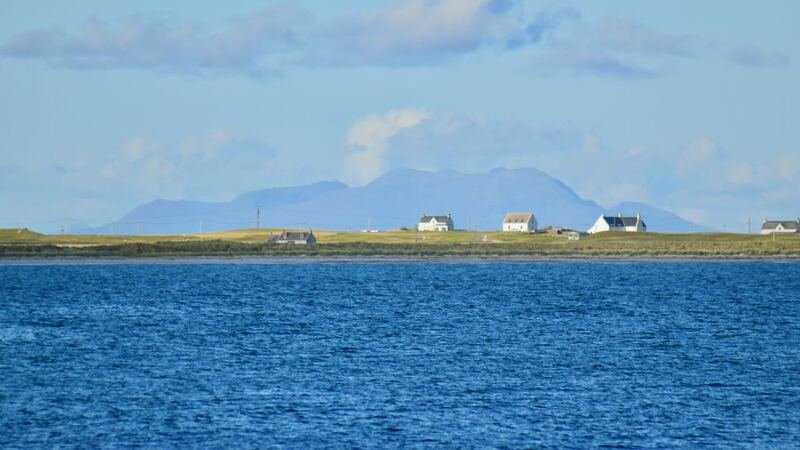 Due to the many bays on Tiree, Rum appears to change its location. Likewise at times some of neighbours can look to the eye to be part of Tiree. This is true when momentarily you loose sight of the sea that surrounds the island. On the Pier you look out across Gott Bay. Directly across the bay is the old Ruaig school. Adjacent to the school is the former Congregational Church building. 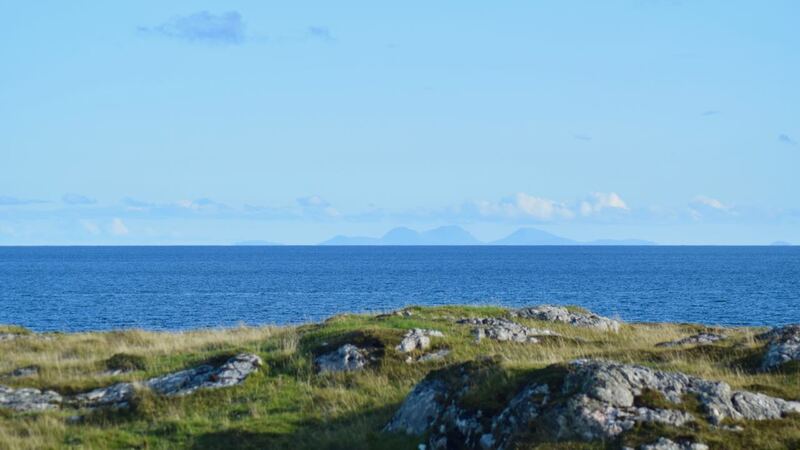 Across the bay, to the north east, is Ben Hiant on Ardnamurchan. 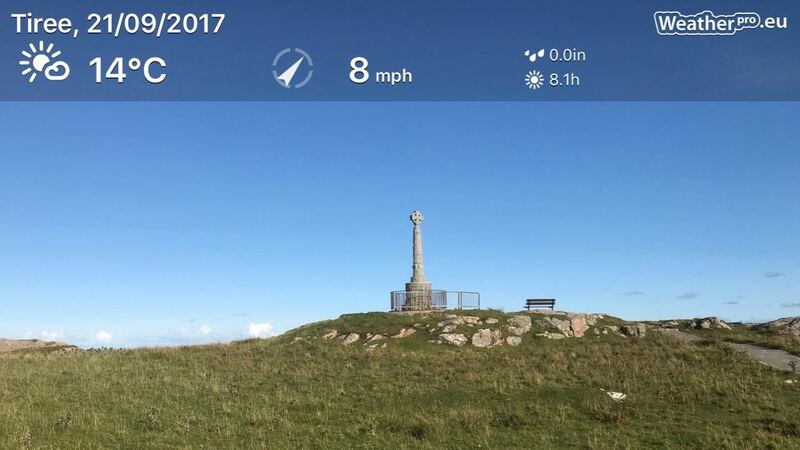 As the highest point out on the Ardnamurchan peninsula it is clearly visible . The rugged profile of Ben Hiant dominates the northern shore of Loch Sunart. 14.1 ° may need seem not seem warm to those living on the Mainland. But, out of the gentle breeze, under clear blue skies, it can feel pleasant. And here at the monument in Pier Road is an ideal place to enjoy the view. The danger is that if you sit too long there is a real risk of being sunburnt! 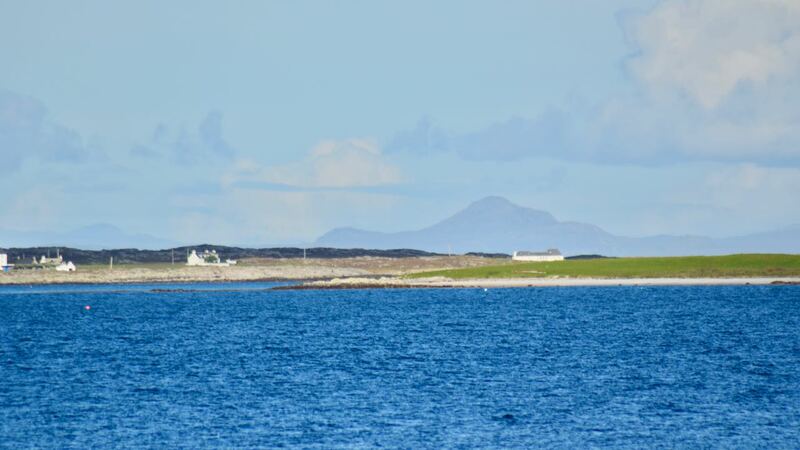 This is Life on Tiree enjoying wonderful Autumn weather.